Get your Mortgage needs figured out with our reliable Mortgage Lender in Maize, KS. Call us today at (316) 683-4700 and Apply Now on your next loan! Our Maize mortgage lender is here to tell you how wonderful Maize is. Maize is a suburb of Wichita Kansas located in Sedgwick County. Located within the “Corn Belt” is where Maize derived its name from. As of 2010, Maize has a population of 3,420. 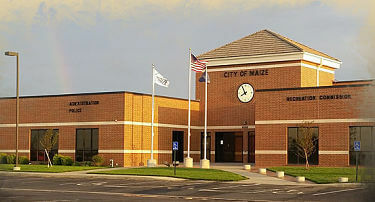 Maize enjoys the metropolitan status in a rural surrounding. It is a unique place to live with low crime rates and a easy access to the entire metro area. Taking all of those things into consideration is a very important thing to do when you are looking to by a home and spend the next 10-30 years in a location. With that, you will need us as the best mortgage lenders in Maize, Kansas. We can help you with FHA loans, Conventional Mortgages, VA Loans and more. Take a look at our client’s reviews and see what your neighbors are saying about our services. There is so much to know about getting a residential mortgage, including what needs to be done to get your loan approved. That is why our Team of Specialists will be there for your every step of the way! After your loan Pre-Qualification, our Loan Processing Specialist will guide you through all of the supporting documents needed. Once your documents are submitted to us, our Loan Processing Specialist will submit your loan Pre-Qualification application to our Underwriter. Our Underwriter will review and supply us with one of four decisions about the application submitted: approval, approved with conditions, suspended (just means more documents need to be submitted before a decision is made) or denied. We will promptly communicate this decision to you. In some cases, a mortgage approval comes back as “approved with conditions.” Fulfilling and/or answering these conditions, is the first of two important steps that you must complete to turn your “approval with conditions” into a mortgage loan that can be funded at closing. The second step, is to lock in the interest rate and loan term. This allows us to fund your loan at the specified interest rate. This will remove the risk of fluctuating interest rates as we are “locked”. This lock is typically good for 30 days but it is possible to lock for longer or shorter periods of time. Once that is done, congrats! You now are ready to close on your new home. Rest assured we will help you through the process and communicate every step of the way. This is how we have been in business for over 20 years. She’s a great loan officer—extremely helpful and frequently available.